•Should a mediator be trained in the topic they are mediating or not? Some argue 'no,' what one needs to know is how to bridge human divides, and the topic itself is not central. Some argue 'yes,' especially when the subject matter is especially complex; that without topical expertise, one will likely miss opportunities for agreement. •Is a successful mediation about the results or the process? Those who argue the former often suggest that whatever feathers are ruffled will smooth out with time, especially if the results are desirable to all. Those who argue the latter suggest that without healing relationships through the process, any agreement may be too fragile to last. "On these and a host of other complex dichotomies, Chris Maser and Lynette de Silva seem to answer simply, 'yes'—all sides have value, and the dichotomies are mostly false. Perhaps because of their vast experience, both starting as scientists, then evolving to roles as mediators/teachers/trainers/researchers, their contribution with this work is not to advocate for any particular school of thought, but rather for the value in all sides of each complex setting, to be appreciated rather like the facets of a diamond. "The reader finds this exquisite blend of the physical, emotional, mental and spiritual worlds throughout. This wonderful work is part description of some of the world's most seemingly intractable problems, part ethical polemic, part how-to manual, and, importantly, part how-to-teach manual. The authors are not satisfied with simply describing what's wrong with our relationships with each other and with our environment, nor do they stop when you personally are committed to action, but they will also give you both the motivation and the tools to help others learn how to do their parts in healing these relationships as well. "This is an important, readable, thoughtful book. As they suggest, 'ways will be explored through teaching and practice that will enable society to replace non-constructive patterns and incorporate more meaningful connections'—aspirations that are sorely needed for our difficult times, and these are the guides to help us on our way." Principle 7 — We Must Consciously Limit Our "Wants"
WHAT LEGACY DO WE WANT TO LEAVE OUR CHILDREN? There are two primary emotions: love and fear. All other emotional expressions are merely aspects of these two. Kindness, compassion, and patience are the hallmark of love, while impatience, anger, and violence and are the stamp of fear. Thus, where unconditional love dwells, there dwells also peace, contentment, and harmony—both inner and outer, whereas fear cannot endure. Where fear dwells, there is discord, discontent, and conflict, wherein peace cannot be found. Conflict—like cooperation—is a choice, but one born out of one's fear of being out of control, whether of one's physical life, financial security, personal identity, or coveting someone else's possessions, such as land and its recourses. Moreover, the dynamics of conflict are essentially the same, whether interpersonal, intertribal, international, or interreligious. Strife, after all, is dependent on the notion of inequality: I'm right; you're wrong. I'm superior; you're lesser. I belong; you don't. This is mine to do with as I wish; it's not yours—hands off. I want what you have, so give it to me or I'll take it. The challenges we humans face in today's world are the result of unconscious, competitive, conflict-prone social conditioning, which begins at birth and ends at death. There is, however, no such thing as "right" or "wrong" in the universe, which is an all-encompassing relationship based on eternal creation and novelty, wherein all change is impersonal, neutral, and irreversible, despite the outcome. Social conditioning, on the other hand, creates a myriad of perspectives that, in turn, spawn infinite, personal perceptions (human values), each accepted as "the truth"—from a certain point of view. The paradox is that everyone is "right" from his or her vantage point, which creates a venue of "right, right, and different." So, the question (and the heart of conflict resolution) becomes: How do we negotiate the differences, while honoring one another's perceptions? This being the case, resolving a conflict is based on the art of helping people, with disparate points of view, find enough common ground to ease their fears, sheath their weapons, and listen to one another for their common good, which ultimately translates into social-environmental sustainability for all generations. As it turns out, people agree on virtually 80 percent of everything—unbeknownst to them—and disagree on 20 percent, which becomes the sole focus of their dispute. If, therefore, disputants can be helped to see and move toward the predominance of their agreement, the differences ensconced in their quarrel are more easily negotiated. Ultimately, however, it is necessary for the participants to formulate a shared vision toward which to strive, one that accommodates the personalized perceptions to everyone's long-term benefit. Only then can the barriers among disputants dissolve into mutual respect, acceptance, and potential friendship—only then is a conflict truly resolved. "Lynette de Silva's contribution brings to this new edition up-to-date educational practice for both professional development and the college classroom. 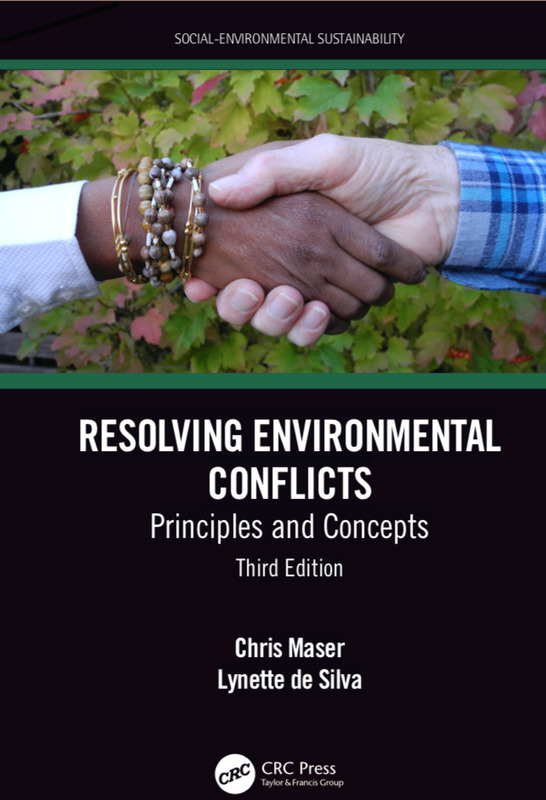 The philosophical underpinnings for resolving environmental disputes benefit from the practical guidelines in this book on how to translate theory into educational practice. Two very different experts have collaborated on this important treatise." "Whether you are a student new to the process of resolving conflicts, or an experienced practitioner, this book will speak to you with its practical examples, its consideration for all involved with a focus on a healing approach, and its different perspectives from the authors. The reader will certainly come away with a better sense of what leads to conflict, and the path forward for a sustained and peaceful collaboration." Oregon State University, Corvallis, Oregon.